Enjoy the sunset in the enclosed backyard with a panoramic view of both the mountains and lake. Very quiet cul de sac. Covered patio with barbecue and patio furniture. Enjoy simple comforts with home amenities. 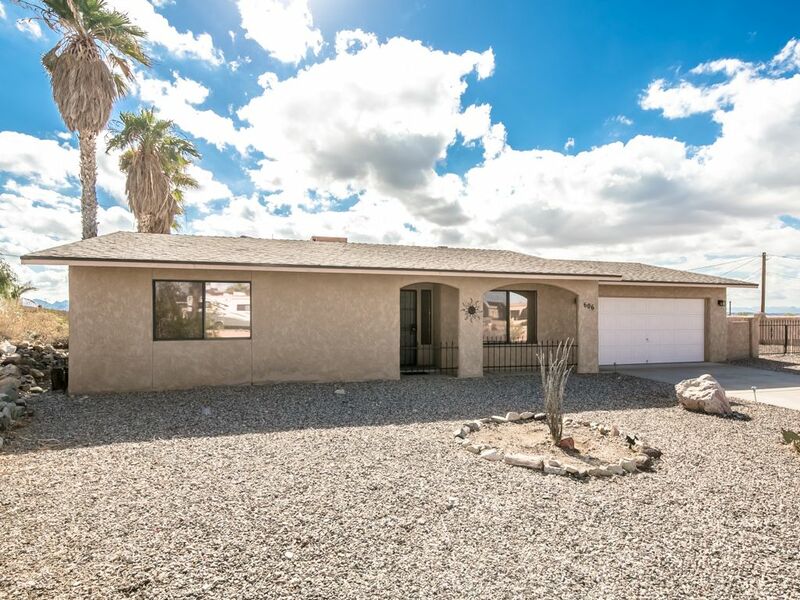 Clean 2 car garage and gated RV parking. Large capacity washer/dryer in garage. TV with cable and DVD/VHS player. One mile to all conveniences, golfing, shopping, launches and nightlife. Convenient Boating Rental and Launch: During boating season, this home is a straight 1 mile distance to Windsor launch ramp. If renting a water vessel it is a straight 1/2 mile distance from one of the largest rental providers in Havasu. If questions inquire with owner. RV parking on the side of the home will help secure your water crafts, as well as a two car garage. Snow Birds Love this Home: During fall/winter season this home is very close to downtown, london bridge and local restaurants. Very easy to find off highway 40. Beautiful views and a cozy enclosed patio add wonderful memories to your stay. Indian gambling and Laughlin, Nevada gambling are both about an hour away or across the lake by Ferry. Four wheel drive clubs are also popular in the winter months for the ideal weather and gorgeous scenery. Sail boating is primarily a winter sport here and there are tour boats to see various areas of the lake and the topok gorge. There is golfing in downtown Havasu and in about 45 minutes drive there is another golf course in Parker, Arizona. We love boating and have enjoyed many years in Havasu. We list this home only with Home Away and its affiliates like VRBO. Please inquire only through these sites. We loved the backyard view with the large palm trees. Such a great location too for us and our visitors. Upon arrival there will be toilet-paper, soap, cleaning products and laundry detergent, upon extended stay this is your responsibility. The Best Rental in Havasu! What a beautiful home! Upon our arrival we found the home to be very clean and beautifully decorated giving the feeling of being at home. The house is supplied with all of the necessities a family would need. Outside was a wonderful view of the lake. Of all the places I have stayed in Lake Havasu this is the best and the only one where I'd return. Home of the London Bridge next to Lake Havasu known for boating and water sports. Brightly colored mountains and high desert make Havasu ideal for motorcycle riding and scenic drives. Close to Indian gambling and Laughlin, Nevada gambling. Ideal get away for Snow Birds. Pets must be approved through owner who has the right to refuse any pet. Winter season during November to March requires 1400.00 Security Deposit and lease Contract to book stay. Nightly stays do not require security deposit.